I can become obsessive about things – although I like to think of it as extreme curiosity. It’s a good quality that benefits many people because I love to share the results of my obsessiveness research. Awhile ago I decided to buy a water bottle but I didn’t want just any water bottle, I wanted the best water bottle. Thus began extensive research and testing of water bottle (and tumbler) specs, features and reviews. This is the first water bottle that I bought. It is fine, but the plastic mouthpiece is difficult to keep clean and needs replacing from time to time. Extra mouth pieces and straws are sold separately for this purpose. I do like the carrying handle, something that many bottles do not have, and the mouthpiece is useful during sports or when you want to move and drink at the same time. Camelbak is a basic water bottle and will suit basic needs just fine. Although Tervis does make a water bottle, I only have the tumbler – but they are made the same. I bought this tumbler for my daughter, who loves all things monogrammed (she fancies herself a Southern girl). The Tervis is insulated and keeps drinks cold enough. There are several different lids and endless designs; they make great gifts. I have no complainants with Tervis; it’s a solid well-made tumbler that is microwave, freezer and dishwasher safe. I love my bkr bottle. It is made of glass so there is no metal after taste like from the stainless steel bottles and no chemical leaching; the water just tastes clean and pure. The design is beautiful. 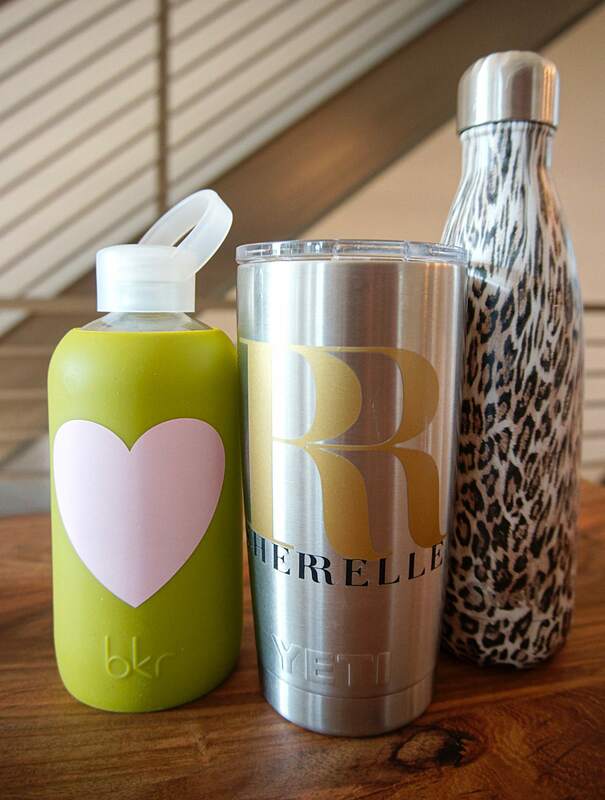 Apparently I’m not the only one who loves bkr; it is a cult favorite among celebrities. This is my favorite bottle to take to exercise class. However as much as I love it, there are 2 things that I do not like about the bkr bottle. Although the silicone wrapped glass bottle doesn’t break easily when dropped, the plastic cap does. I’ve dropped my bottle and the cap snapped off leaving a sharp edge (they do sell extra caps on the website). Also the bkr bottle is not insulated and does not keep water cold. That’s not a problem for yoga class, but it’s not ideal for all-day sipping on a hot day. Once again my daughter’s Southern kinship turned me on to something that I would not have ever tried. She received a Yeti tumbler for her birthday and was thrilled – apparently Yeti is all the rage among her people. I had seen it in outdoor stores, but had never thought anything of it because I am not the target audience – hunters and fisherman and other outdoorsy types. My daughter loved hers so much that I decided to buy my son one for Christmas, but unfortunately all of America had the same idea; Yeti tumblers were sold out everywhere. I checked online and my local stores every few days and they all said the same thing: as soon as they got a shipment, the tumblers were gone within minutes. Yetis were selling on Ebay for a premium price. Finally on Christmas Eve my husband happened upon a small hardware store in the country; they had just gotten a shipment of tumblers. He bought one for my son, himself and me. After using it for awhile now I have to admit that Yeti is worth the hype. The doubled-walled tumbler doesn’t sweat or burn my hand and it keeps cold drinks cold and hot drinks hot for hours. My friend sent me a photo of her friend’s crashed and burned car. Inside was a Yeti tumbler, charred on the outside but with ice cubes still inside. The original Yeti tumbler only had a sipping lid, which was great for hot drinks but not cold. Recently the company added a lid with a straw and I love it; I use this lid the most in the car and around the house. According to my daughter everybody decorates their Yetis with stickers. Embracing the Yeti culture, I did the same thing but I went a step further: I had a custom sticker made of my logo. Some may call that being extra, I call it being fully committed. 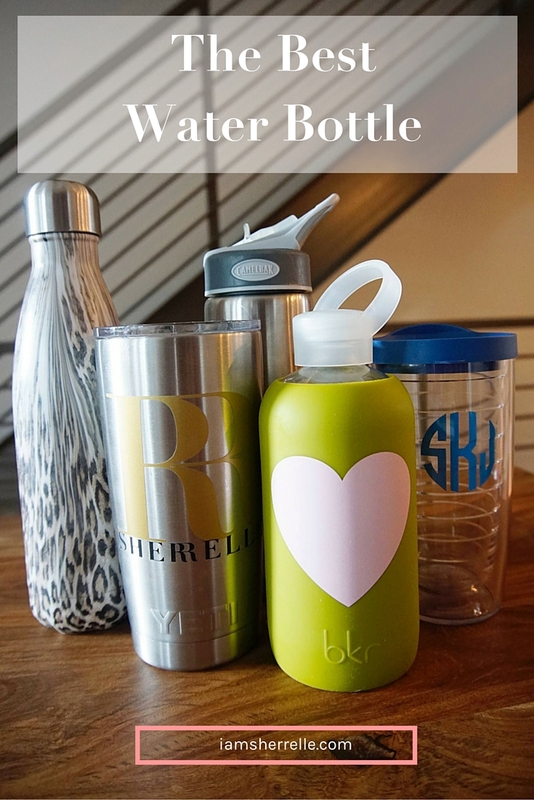 I love the bkr bottle for exercise class and use the Yeti tumbler at home and during car travel, so that should have been the end of my search; I had a great water bottle and a great tumbler. Except I was going on a beach vacation and neither of these would do. I couldn’t transport the Yeti tumbler in my beach bag and the silicone sleeve on the bkr would be a sand magnet. I needed a S’well bottle. Double-walled stainless steel keeps liquid cold (or hot) for hours and the cap has a vacuum seal so I could throw it in my beach bag without worry. The sand would slide right off the smooth finish with no condensation. No doubt functionally S’well was a good water bottle for the beach, but I was going on vacation and style mattered too. Luckily there are many colors and designs of S’well bottles and I was able to find the perfect one to rep my style. 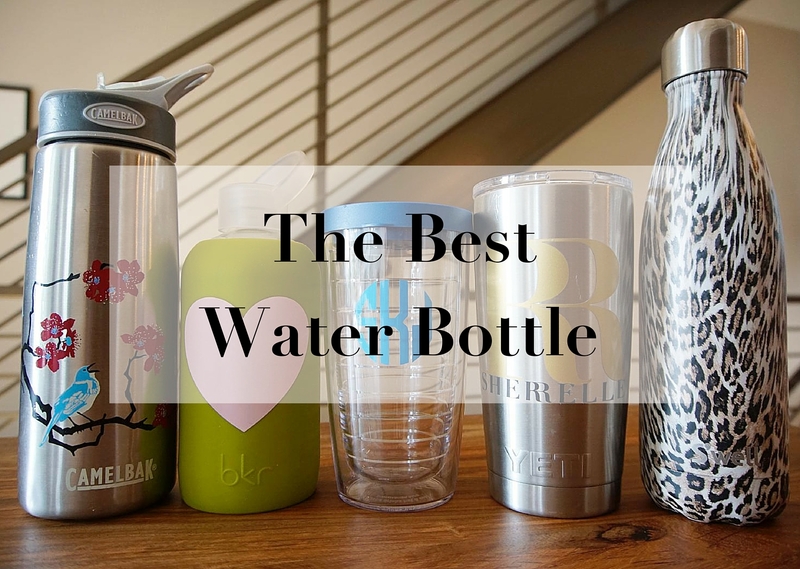 So which is the best water bottle? I’m afraid that I can’t pick just one! bkr is my favorite water bottle overall, but there are some situations when it doesn’t work – then I turn to Yeti or S’well. Those are the 3 that I keep in rotation. Hey I may be obsessive, but at least I’m well-hydrated! What size s’well do you have pictured there? I’m trying to decide between the 17 oz and 25 oz? Hi Emily, That is a 17oz in the photo. My husband has the 25 oz and while he likes that it holds more liquid if he is doing strenuous exercise it is really big and sort of awkward to hold. It doesn’t fit in the car cup holder, if that is a factor for you. I hope that helps!